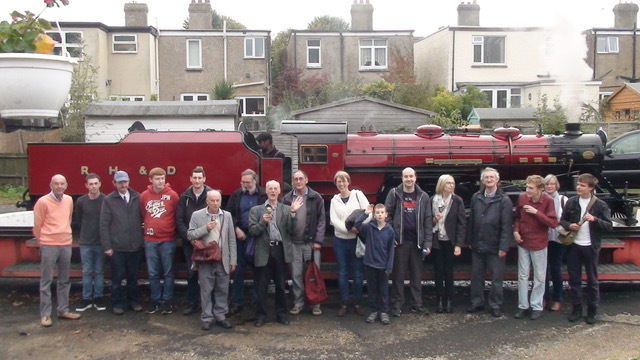 In celebration of the completion of the first main phase of the extension project of our miniature railway, the Crowborough Locomotive Society decided to have a social outing where members could relax and enjoy themselves in an environment free of wet cement and tons of earth! William, the Society’s friendly webmaster no less, took it upon himself to organise a visit to a miniature railway a little bigger than most. The Romney, Hythe and Dymchurch Railway was ultimately a millionaire’s toy train-set, now a preserved working railway, and they catered to our every need for a day. Starting off with a tour of the locomotive works at New Romney, followed by a trip to Dungeness and their newly refurbished cafe for lunch. Obviously to mark the occasion this would need to be no ordinary train. Heritage carriages were hired exclusively for our Society’s use. Firstly, a well stocked bar car (naturally) – which happens to be the longest 15″ gauge vehicle in the world. And secondly, the last surviving RHDR Pullman coach dating from the 1930s. A complete round trip of the line after lunch ensued, with a photo opportunity with the loco on the turntable on reaching Hythe – jeopardising the timetable in the process! Our locomotive for the day was a Canadian outline designed locomotive, which were ordered because of their larger cab with better weather protection for winter running, named Winston Churchill. The finishing touch and superb advertising was the headboard which was arranged and designed, in Southern green with yellow lettering, with the wording “Crowborough Miniature Railway Extension Project 2014 – 2018”.